Casa de la Playa is perfect for two families who want to vacation on St. Martin’s glamorous west coast. It has four suites for adults and one children’s suite with two double beds. Each bedroom opens to the pool deck and covered veranda, so older kids are ideal. One of my favorite features of this villa is that each ensuite bathroom has a massive walk-in shower straight out of a luxury hotel. Did I mention that Casa de la Playa has a full-service staff, including a French chef who will prepare 3 meals a day for you and your guests? Beachfront estate on Long Bay Beach! Casa de la Playa is a beachfront villa in Terres Basses. This fully air-conditioned vacation home has direct access to Long Bay, a full staff, and five ensuite bedrooms. A long cobblestoned driveway lined by lush and vibrant gardens sits just behind the property’s grand wrought-iron gate. The infinity pool has a unique, winding design with a circular wading area at one end and a diving board at the other. 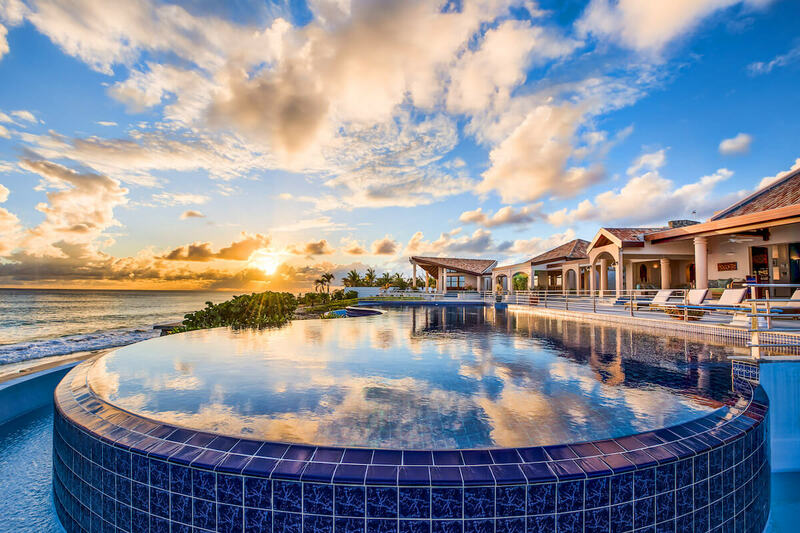 A stone lounging terrace runs along the pool and faces the sea. A couple steps up from the pool, there’s a veranda shading the dining and living areas. The veranda has high, exposed beam ceilings and mood lighting that won’t distract from the nightly sunset. A gardener and pool service keep the exterior in perfect condition. Guests can also ask the caretaker to set up a projector screen on the side of the house for movie nights under the stars. The Great Room, with vaulted ceilings made from Brazilian Cherry hardwood, has large sliding glass doors that open to the veranda and pool deck. The Great Room is furnished with a grand piano, a billiard table, a flatscreen TV with surround sound, and an Apple theatre system. Just off the Great Room, there’s a home office with a Mac desktop and printer. The in-house Chef and Butler will take care of three meals a day, all prepared in the villa’s gourmet kitchen. A housekeeper maintains the home daily. The five bedrooms each enjoy beach views, access to the covered terrace, a large ensuite bathroom, and a Smart TV. The Master Suite is secluded from the Great Room and boasts 800 sq. ft of living space and a king bed. It’s ensuite bathroom has a soaking tub and a massive rain head shower. The four other bedrooms are placed on opposite sides of the Great Room and have ensuite bathrooms with large walk-in showers. Two suites have queen beds, one has a king bed, and the fourth has two double beds. The fourth suite is perfect for children, with a desk for coloring or writing and storage for toys. With large vaulted ceilings, each bedroom is a private oasis. Located on the same beach as the famed La Samanna resort, Casa de la Playa is only 15 minutes to the Juliana International Airport, 15 minutes to the quaint Creole town of Marigot, and a further 15 minutes to Grand Case, Hope Estate, and Cul de Sac. pool size 65 ft., Infinity pool with a diving board and pool fence. Three meals per day (cost of food and drinks additional). Mandatory provisioning allowance of $4000/week is required. Car rental, grocery and beverage shopping (pre-arrival and during your stay), liquor and wine delivery, nanny service, baby equipment, spa services, yoga and personal training, photography, and private airport transfer/car service can be arranged for an additional fee.